The oldest manmade summit level canal in Britain and Ireland runs from Newry to Portadown. 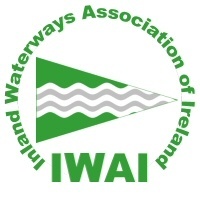 The local branch of the Inland Waterways Association of Ireland (IWAI) has the longterm ambition of restoring the canal and once again joining Carlingford Lough with Lough Neagh. The inland canal was opened in 1742 to transport coal from the coalfields of Coalisland to the hungry hearths of Dublin. As a groundbreaking experiment in mass freight transportation it was the space shuttle of its day. By the late 1800s, however, the railway had overtaken it as the workhorse of the transport industry. One of the last major projects for freight transportation on the canal was to carry building materials for the railway itself which ran alongside it. In the 20th century the canal fell into disuse and disrepair. A small band of campaigners succeeded in keeping the waterway intact and safe from developers. It is their efforts over the last 40 years that allows us, in the 21st century, to hope that there may once again be boats on the Newry to Portadown canal. The inland canal is owned by the two local councils bordering it. In 2005 they completed the upgrading of the towpath making a long distance waymarked walk between Newry and Portadown. This walk is second only to the Giant’s Causeway in annual visitor numbers. It is our aim to make these visitors aware not only of the history but also the future potential of the ribbon of water that runs alongside. The IWAI Newry & Portadown branch has already begun to conserve and restore the waterway with our regular work parties. Volunteers have been removing trees and vegetation from the lock chambers so that the still impressive craftsmanship and architecture can be better appreciated by the public. We have lobbied locally and nationally to have restoration of the canal placed on the political agenda. The branch has successfully applied for funding for projects to increase public awareness of the canal and to encourage the various waterside communities to become part of our cause. In 2015 we built two sets of gates and installed them at Poyntzpass and near Scarva. 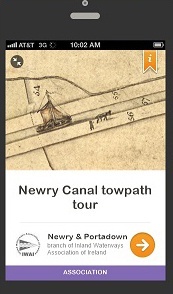 We produced the “Guidego App” which is a GIS tour, full of information and photos, of the heistory of the canal. We manage the Sluicekeeper’s Cottage at Acton as interperative cntre from Easter to Halloween. It is open most weekends from 11.00am to 4.00pm. Our future plans are to continue to lobby and campaign; to fund raise and apply for grants; to maintain and conserve the architecture and industrial heritage of the canal and to continue our voluntary groundwork. We are also lobbying for Waterways Ireland to take over the Newry to Portadown Canal as being the best way to have the canal re-opened.